3D Maps of Mumbai + GPS Navigation. App for Android. 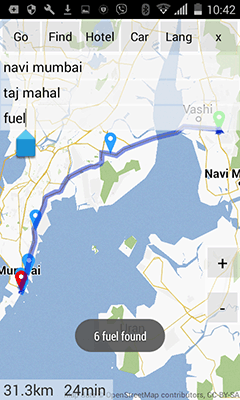 Download the whole Mumbai and satellite cities for navigation without internet connection. Free GPS app for Android. 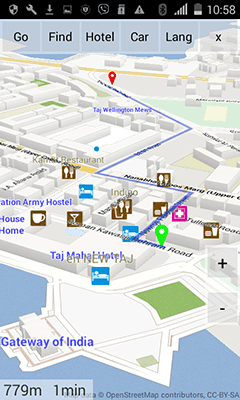 - Detailed 3D/2D maps of all roads and towns around Mumbai with street addresses. - Food, hotels, museums, banks, attractions, gas stations, etc. - Internet access is not required. Offline maps saves your time and money. No roaming charges. 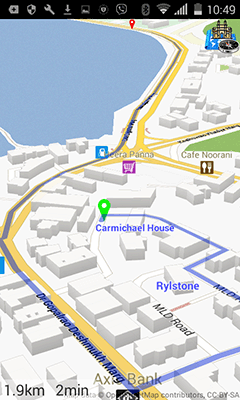 - Compact and quick vector maps saves memory and battery of your phone. - Use two fingers to zoom, rotate, and tilt to 3D mode. - Fastest routes optimized for car, bike and pedestrian. - Suitable for highway and off-road. - Simple routes: long-press on the map to create route. 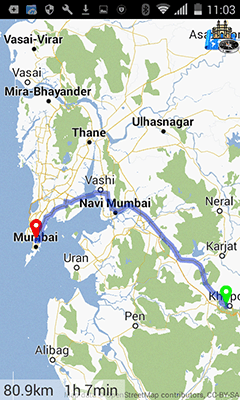 - Download all routes in Mumbai, then use it anytime. - Routes calculated by your phone, no internet needed. - Fast algorithm calculates routes within seconds even on old phone or tablet. - GPS satellite and WiFi navigation. - Map rotates in driving direction. - Navigation in 3D and 2D modes. 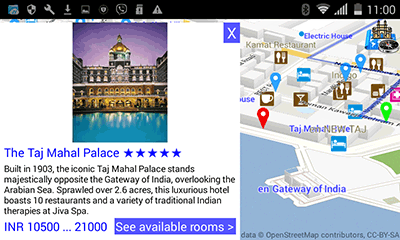 - Over 900 hotels in Mumbai saved on your phone. - Find hotels, appartments and villas on the map. Check prices without internet connection. - Find nearest cafe, restaurants, hotels, fuel, parking, etc. - Search for places along your route. 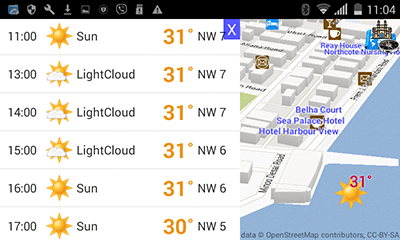 - Weather for any location - just press on the map to get 10 days forecast. Navi Mumbai, Thane, Kalyan-Dombivali, Mira-Bhayandar, Bhiwandi-Nizampur, Ulhasnagar, Vasai-Virar, Panvel, Ambernath, Kulgaon-Badlapur, Uran, Alibaug, Pen, Matheran, Karjat, Khopoli, Palghar. Marine Drive, Gateway of India, Bandra Worli Sea Link, Siddhivinayak Temple, Haji Ali Dargah, Chhatrapati Shivaji Terminus, Water Kingdom, Iskcon Temple, Adlabs Imagica, Nehru Science Center, Bandra Bandstand, Prince of Wales Museum, Film City, Juhu Beach, Babulnath Mandir, Elephanta Island, Mount Mary Church, Mahalakshmi Temple, Kanheri Caves, Taraporewala Aquarium.